WHY!!!! Broken but not dead. 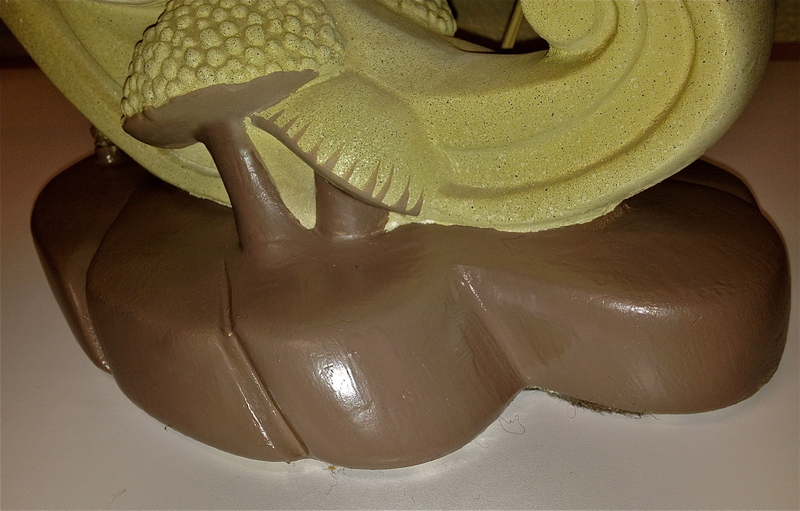 I thought I’d blog about how to fix a chalkware lamp. These lamps are also known as plaster lamps. I came across this at my friend Franks house. 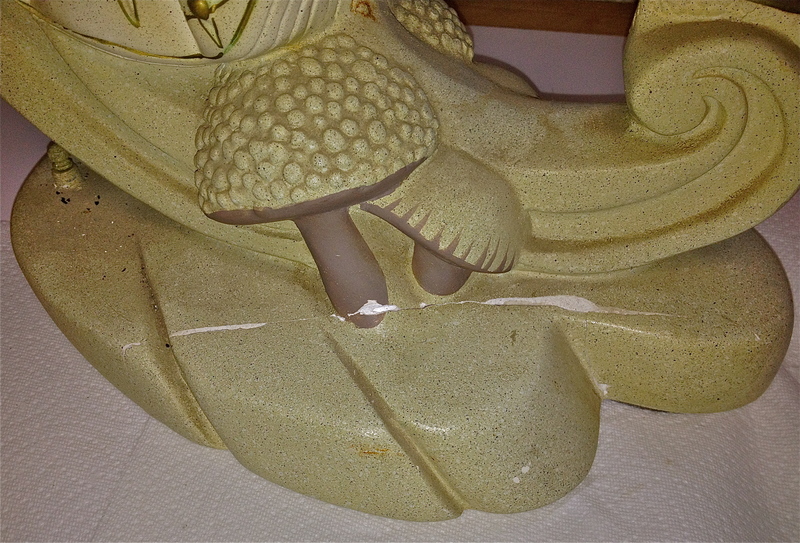 He received it from a friend of his but as you can see it had a major break to the base. I wasn’t sure I could fix it but I thought I would give it a try. I asked Frank if I could purchase it and he said “sure can” so I went home to start work. Wow, it’s really bad looking isn’t it? Maybe if it faces the wall no one will notice. 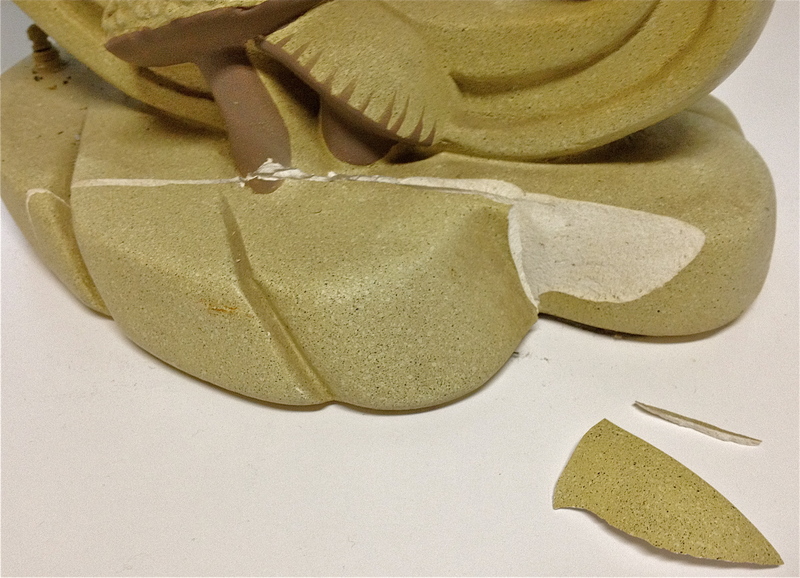 The first thing that had to be done was glue the broken pieces back to the body of the lamp. 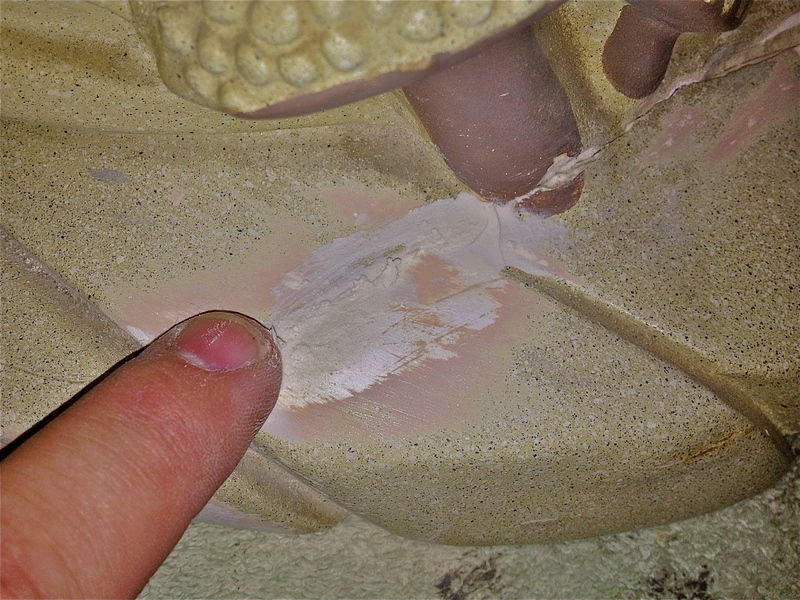 I debated between a few different adhesives such as silicone, JB Weld or rubber cement. I though about the flexibility those adhesives have which would eventually cause the fix to fail. Then I remembered “Gorilla Glue“. This stuff is crazy good when gluing things together. Once I managed to get the cap off the glue tube (they stick sometimes after use). I started to glue the shards back to the lamp. You only need to hold the pieces in place for 30 seconds and they will hold. I wanted to make sure it dried so I let it sit for and hour before I started sanding. Glue is holding like a champ! I wanted to sand before I applied the filler to level out the surfaces. The next step was to fill the gaps left from the pieces that were missing. 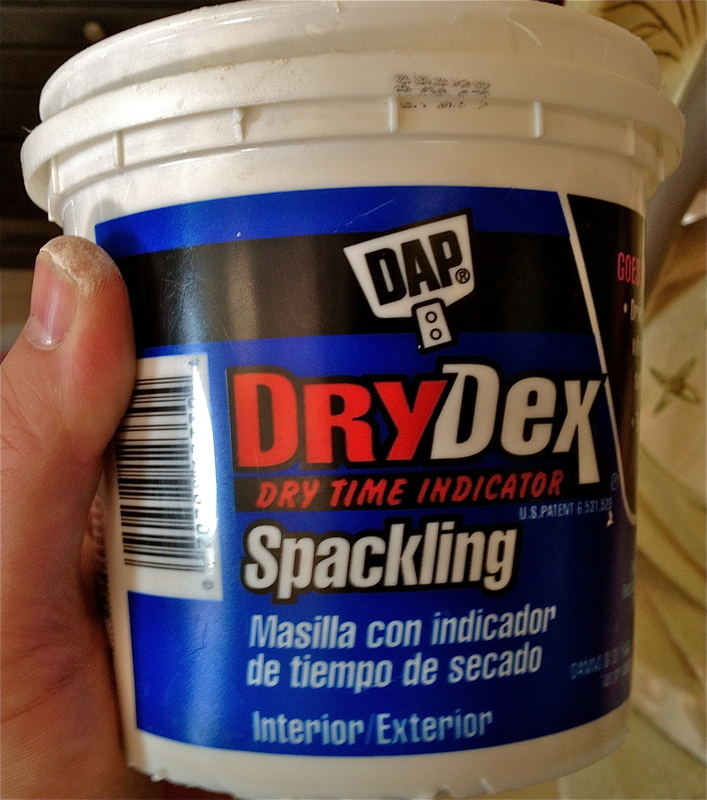 I wasn’t sure what to use but then I remembered that “DAP Spackling” was a chalky substance and would fill the gaps perfectly. This stuff is usually used to patch holes on walls but I had confidence it would work. I applied that spackling in small amounts till I had all the gaps plugged. Once all the gaps were filled I had to wait 4 hours before sanding or painting. I placed it out in the sun to help expedite the drying time. Once I got it into the light I realized that the fairy was very faded and I decided at that point I would have to paint it as well. Once it was completely dry I sanded off the excess spackling. 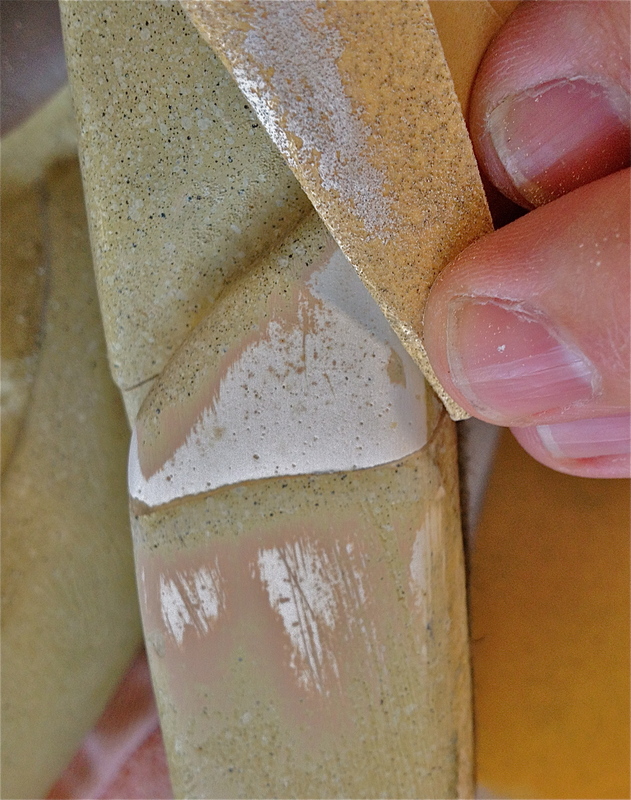 You want to sand it enough to when your finger slides over the surface it feels like there is no crack. Paint shows all faults so if this isn’t sanded completely flush it will show, trust me. Smooth as a baby’s bottom. Now time for the paint. I swung into Lowes and had some paint mixed. I ended up purchasing BEHR eggshell “Mountain Ridge” house paint. I would of tried to spray paint but that would be hard to control. I had to paint the fairy and the base the same color. the cream color would of been very hard to duplicate because it had a spackled finish. 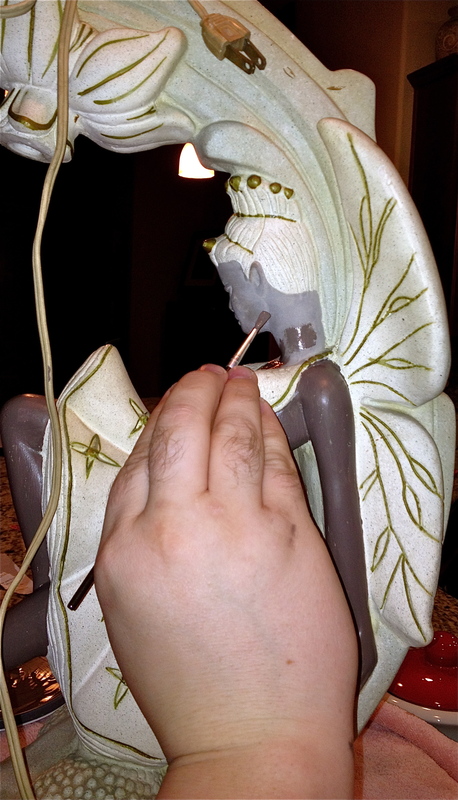 As you can see from the paint I am applying how faded the fairy was. Once it was all painted it just needed to dry. House paint is kind of funny because you think you have a good coat and later you will find some spots that need touch up. As it sits now it looks great but maybe tomorrow I might have to do some touch up. So without further adieu here she is! Where is the crack?! It’s gone! I am very pleased with its repair and restoration. I will now have to shoot over to Meteor Lights to order a shade for it. 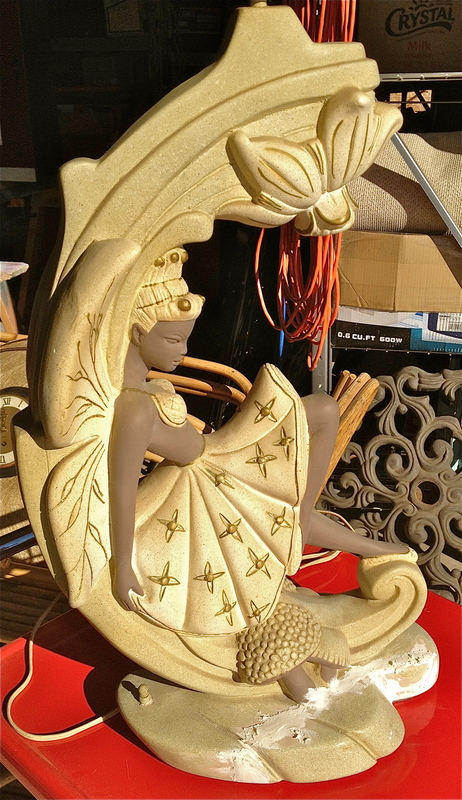 Posted in Restorations and tagged chalkware, chalkware lamp repair, chalkware lamp restoration, chalkware lamps, chalkware repair, chalkware restoration, Continental Art Company, plaster lamps, restoration, retro decor, retro lamp, retro lamps, vintage lamps. Bookmark the permalink. I’m always so impressed with the care, detail and, let’s face it, Love you put into bringing these pieces back to their glory! She is simply stunning! Thanks for your kind words. 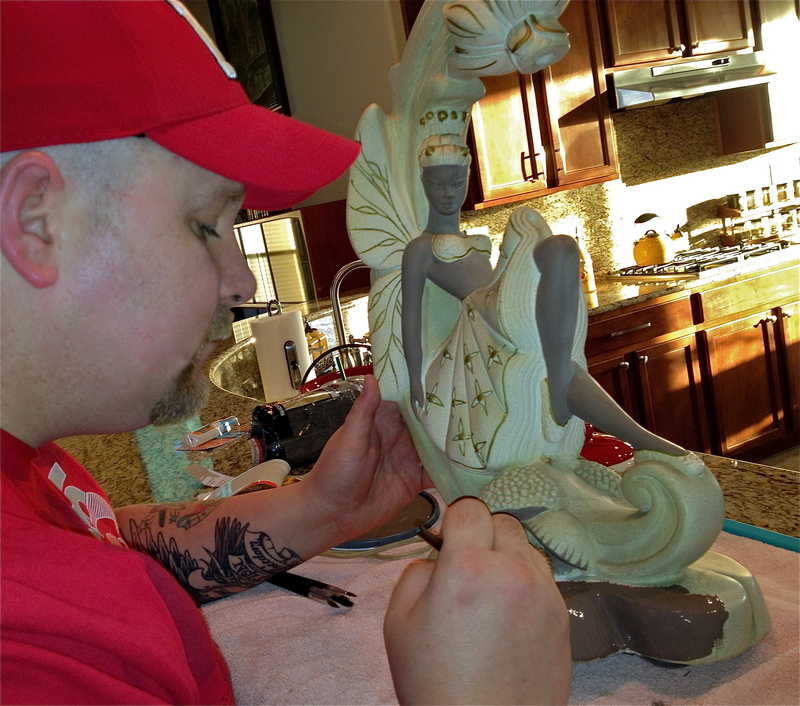 I do love restoring antiques and I hope all of you enjoy seeing the process. I seem to have more projects than time but I guess that can be a good thing. Thanks again. Fantastic! I think the lamp base with that colouring actually looks better than the original – it balances it out a little more. Great work! I agree. It really looks great with the change in color to the base. Thanks for visiting my site. I am soo glad I could help. Thanks for visiting my site. I hope to hear from you again. I am really happy with the repair. Thanks Vic for the positive feedback. I want every lamp I see on here. The horse lamps are way awesome. Great repair work. I have a bunch of TV lamps. I will keep collecting until house is full….soon. Thanks for this great explanation! I want to touch up a pair if chalk ware lamps I just bought! Thanks for the only chalkware restoration I can find online! I have a reglor pair that didn’t make it through a move and am trying to restore them…. but, I’m having less success than you! I can’t seem to paint without leaving big brush strokes. Have tried a few brushes and am still getting a really streaky look, nothing like the original smooth eggshell finish. Do you have any tips for preventing brushstrokes? Hi Lucy. Try not to go over the same spot more than once. Paint one coat, let dry fully, then go in with another coat. I have to do 3-4 coats sometimes. The chalkware lamps were typically painted with an airbrush, so you won’t be able to completely duplicate that finish without airbrushing. I was wondering if you happened to know if there has ever been anything to cover the night light? Like a flower shaped glass shade perhaps? No, there was nothing to cover the night light. Other examples of our lamp don’t show a cover either. Back in the day they used bulbs like the Westinghouse Starlight chandelier bulb, and you can still get them. Adds so much to the lamp. They do look like little stars. Thank you so much for sharing your restoration process! 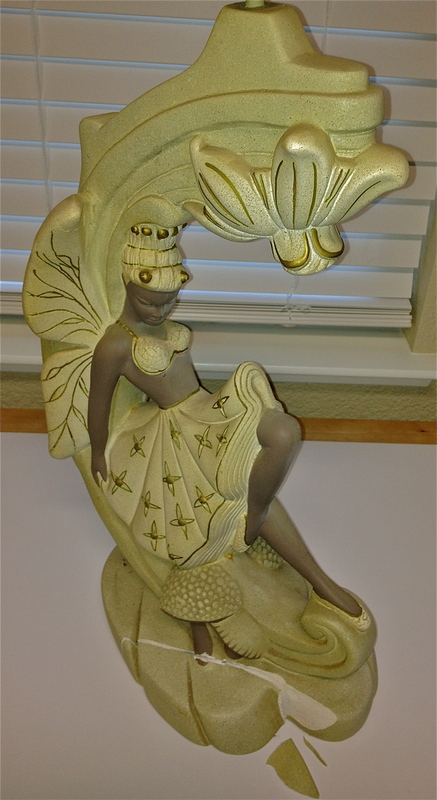 I’m going to use this blog as a guide for when I attempt to repair a chalkware/fiberglass shade lamp (TV lamp?). It’s not cracked but is missing some pieces. Great! I hope it helps! Your blog has been so helpful! 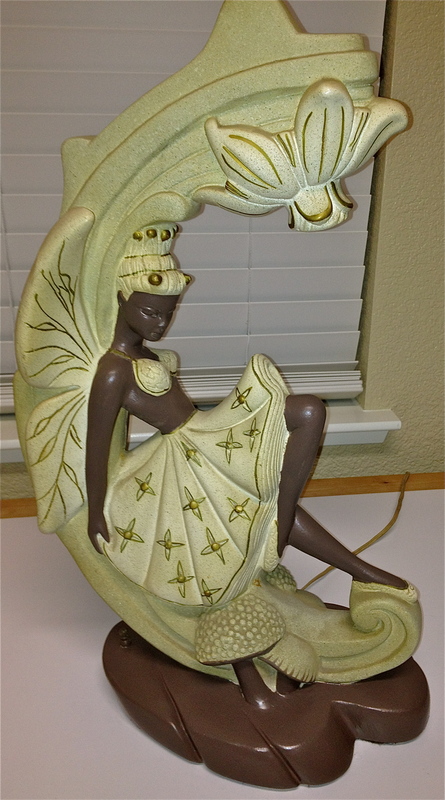 I’m on my second repair of some chalkware lamps now but am having trouble re-wiring them. Threading the new wire from the lamp kit into the lamp seems impossible, the wire is too thick. I’m going to search for thinner wire, but wondering if you have any tips on lamp kits or rewiring these old lamps, particularly getting the new wire threaded through. Thank you! Thanks! Lowe’s and Home Depot sell re-wire kits. The trick to pulling the new cord through is to tie them together in a way that will allow you to feed the new wire through the top of the lamp.